CHANGSHA, China -- Clean technology in China has left other nations in the dust largely because its centralized government enables policy creation at the snap of a finger. At least, that's what many outside observers think. Zhang Yue, founder and chairman of Broad Air Conditioning, achieved the new Chinese dream of making millions, but then dropped the jet-setting life for a green philosophy that determines company policy. He began doing this well before the mandarins in Beijing began encouraging clean tech. His example demonstrates that when it comes to the environment in China, individual efforts count for as much as -- if not more than -- what the government orders. While many successful Chinese businessmen are giddy consumers, flaunting their newfound wealth, Chairman Zhang -- as he prefers to be called -- has moved beyond that. "After reaching a certain level of material wealth ... people should focus on their quality of life," asserts Zhang, a small and spry, tight-wired man who looks far younger than his 50 years, despite constantly puffing a cigarette held between his fingertips. 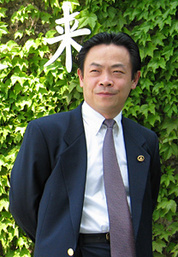 Zhang Yue, the founder and chairman of Broad Air Conditioning. Photo courtesy of Broad Air Conditioning. "Quality of life," he explains, "includes many elements, most of which are irrelevant to money." Today, he leads a low-impact life, and demands colleagues do the same. Other than business flying -- which he only does when absolutely necessary -- he adheres to the "Life Attitude of an Earth Citizen," a 22-point guide for how to minimize each individual's impact on the environment. He wrote and published it in June 2009 and distributes it to any who step onto Broad Town, his company's 1-square-kilometer campus. In it, he urges people to plant trees and not to rely on consumption and travel to fill "empty spaces in life." Moreover, they should "use natural ventilation or a fan instead of air conditioning," he advises. This comes from the tycoon who built an air conditioning business that generated enough wealth to give him his nation's first private Cessna jet. He liked it so much, he ultimately acquired five. He also bought a private helicopter, a Ferrari, a Hummer and a Rolls-Royce. There are many miles of new roads in China, and the smooth, slate-gray highway from Changsha Airport to Broad Town, the campus of Broad Air Conditioning, was built with the help of the company. Further down the road is Changsha proper, the capital of Hunan province. Hunan is known for its fiery food, which many say has nurtured a long history of fierce personalities, most famously Chairman Mao Zedong. Today, it is Chairman Zhang who hopes to change the world and "save people from destroying themselves," as his secretary of environmental protection, Michael Collins, put it. "There's no greenwashing here: Green drives the philosophy, even at the expense of profits." Most Chinese don't discuss their country's pollution or say much about the state of their country. But the culture at Broad encourages open dialogue, at least as far as the environment is concerned. Of Broad's 2,000 employees, about 1,200 live on-campus, receiving free housing and organic food (which is grown at the on-site organic farm). Regular meetings are held focusing on the environment and the role of the individual. Training for employees spans several weeks, during which the company's philosophies are passed on; so is the company song, which is sung each morning at sunrise, following China's national anthem. Born in 1960 in Changsha, Zhang graduated from college in 1980 with a degree in fine arts, then went on to work as a teacher and librarian (Mao's profession at one point, as well). He established the Broad Thermal Engineering Institute in 1988 with his brother, with just $3,000. In 1992, Zhang led a team that created China's first pressure-free hot water boiler and direct-fired absorption chiller. Broad began transitioning away from machinery that used natural gas and toward using waste heat, moving into non-electric chillers, in 1993. Starting in 1998, Broad sold its first unit outside China, to Austin Energy in Texas. Today, the company sells industrial-size non-electric cooling and heating systems to over 60 countries and leads in global market share. From heating and cooling systems, Broad moved sideways into other businesses. It has begun producing air filters that range in size from individual to industrial. The company uses three layers -- electrostatic cleaners, a C02 sensor and an active carton to trap toxins -- to protect against indoor air pollution. From there, the company used its heating and cooling experience to develop low-carbon buildings. They are called Broad Sustainable Buildings, or BSBs, and are viewed as one solution for China's ongoing rural-to-urban upheaval, considered the largest in the history of humanity. Zhang's hope is that these prefabricated homes will house the next wave of Chinese consumers, workers who are starting to think about owning their own homes. These are on display at the Shanghai World Expo, for which Broad is the exclusive supplier of central air conditioning, ventilation and air purification products and is the only Chinese private enterprise among the global partners. Despite Broad's affiliation with the Expo, Zhang remains vociferous and critical, pointing out the innate hypocrisy of focusing on sustainable urban development while also "inducing people to tour, to attract more people for tourism. ... All of the above is quite dangerous," Zhang warns, before pulling another drag on his cigarette. Zhang is not a lone wolf. There are a handful of Chinese businessmen who achieved an early level of comfort and wealth, then redirected their businesses to pursue environmentally conscientious goals. There's Yu Liang, CEO of China Vanke Co. Ltd., China's largest real estate developer, and Qu Jianguo, founder of Shanghai Canature Environmental Products Co. Ltd.
Then there is Wang Chuanfu, the founder of BYD Auto Co., the electric vehicles company in which Warren Buffett has invested. Wang was recently named China's wealthiest man. Still, when talking to those who work with various stakeholders in creating a greener China, Zhang is pointed to as one of the first. "He's one of those people in China who has put his foot down very firmly in trying to lead China toward a greener future," asserts Peggy Liu, founder and chairwoman of the Joint U.S.-China Collaboration on Clean Energy. Yet it's an uphill battle, to say the least. Around Broad Town, the air contains a new whiff of smog. Several new companies have joined the neighborhood. An airplane manufacturer sits about a half-mile down the road to the left; down another mile, there is a new concrete mixing company. All are charging ahead to the beat of the development drum, also hoping to one day attain the new China dream.